This week social media evangelist, blogger and podcaster Bryan Person joins me for The Rundown on BlogTalkRadio. 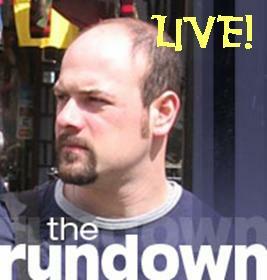 As always, The Rundown is my weekly LIVE podcast featuring an analysis or summary of something by a knowledgeable person – and me. Bryan Person is a blogger at Bryper.com where he shares his thoughts, observations, and opinions about the fascinating new-media and social-media space. He is also the producer of the New Comm Road podcast, a weekly audio show explaining new media and how to integrate it into your company’s communications work. Bryan has helped organize and presented at Podcamp Boston (1 and 2) and is the originator of the Social Media Breakfast. In this age of online community, Bryan has started to focus his attention on using new media to bring people together face to face. And while that’s great and fun for people who live in swinging social media hot spots like Boston, for the rest of us, we have to continue to enjoy our online relationships. [sigh] No, seriously, I’m happy for Bryan. I think it’s great that he – no I don’t. And I’ll be sure to tell him that on Tuesday. Join me for a live verbal lashing.